For other uses, see Latte (disambiguation). A latte (/ˈlɑːteɪ/ or /ˈlæteɪ/) is a coffee drink made with espresso and steamed milk. The term as used in English is a shortened form of the Italian caffè latte [kafˌfɛ lˈlatte], caffelatte [kaffeˈlatte] or caffellatte [kaffelˈlatte], which means "milk coffee". The word is also sometimes spelled latté or lattè in English with different kinds of accent marks, which can be a hyperforeignism or a deliberate attempt to indicate that the word is not pronounced according to the rules of English orthography. In northern Europe and Scandinavia the term café au lait has traditionally been used for the combination of espresso and milk. In France, caffè latte is mostly known from the original Italian name of the drink (caffè latte or caffelatte); a combination of espresso and steamed milk equivalent to a "latte" is in French called grand crème and in German Milchkaffee or (in Austria) Wiener Melange. Variants include the chocolate-flavored mocha, or replacing the coffee with another drink base such as masala chai (spiced Indian tea), mate, matcha, turmeric, or rooibos and other types of milk, such as soy milk or almond milk, are also used. According to the Oxford English Dictionary, the term caffè latte was first used in English in 1867 by William Dean Howells in his essay "Italian Journeys". Kenneth Davids maintains that "...breakfast drinks of this kind have existed in Europe for generations, but the (commercial) caffè version of this drink is an American invention". [dubious – discuss] The French term café au lait was used in cafés in several countries in western continental Europe from 1900 onward, while the French themselves started using the term café crème for coffee with milk or cream. The Caffe Mediterraneum in Berkeley, California claims Lino Meiorin, one of its early owners, "invented" and "made the latte a standard drink" in the 1950s. The latte was popularized in Seattle, Washington in the early 1980s and spread more widely in the early 1990s. Coffee menus worldwide use a number of spelling variations for words to indicate coffee and milk, often using incorrect accents or a combination of French and Italian terms. Italian is caffellatte (the standard form; caffelatte is a Northern Italian variation), contracted from caffè latte (with a grave accent over the e), while French is café au lait (with an acute accent); Spanish is café con leche and Portuguese is café com leite. Variants such as café latte, café latté and café lattè are commonly seen in English. In Italy, caffè latte is almost always prepared at home, for breakfast only. The coffee is brewed with a stovetop moka pot and poured into a cup containing heated milk. 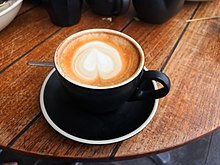 (Unlike the 'international' latte drink, the milk in the Italian original is generally not foamed, and sugar is added by the drinker, if at all). In the United States, an iced latte is usually espresso and chilled milk poured over ice. Unlike a hot latte, it does not usually contain steamed milk or foam. Iced lattes almost always have sugar or flavoring syrups added, and are sometimes served blended with the ice. [self-published source] The espresso can be pre-chilled (sometimes as a mixture of espresso and milk) or frozen in advance to avoid warming up the drink. 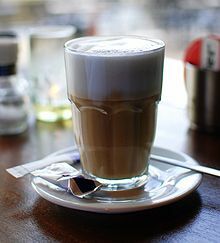 The latte macchiato is milk steamed to microfoam, served in a glass with a half shot of espresso poured gently through the foamy top layer, creating a layered drink with a "macchia"—a spot—of espresso on the top. As with a caffè macchiato, which is espresso with a spot of milk atop, indicating there is a hint of milk underneath the espresso foam, a latte macchiato is the opposite, to indicate there is espresso in the milk. The use of the term 'macchiato' has been widened to include a huge array of beverages and ice creams. In some countries (such as Germany), latte macchiato is the preferred term. The word "macchiato" itself is Italian for "stained" which refers to creating a coffee or milk "stain" in the drink. In Asia and North America, lattes have been combined with Asian teas. Coffee and tea shops now offer hot or iced latte versions of chai, matcha, and Royal milk tea. An Earl Grey latte is known as a "London fog". Calling people "latte drinkers" pejoratively has become a common political attack in Western cultures. The popularity of espresso drinking in large cities, especially among more affluent urban populations, has caused some to consider it elitist behavior. In the United States, conservative political commentators have been known to call their opponents "latte-drinking liberal elites." In Canadian politics, latte drinking is used to portray people as out-of-touch intellectuals and the antithesis of the Tim Hortons coffee drinker that is considered representative of an ordinary Canadian. In Scandinavian politics, the term "the caffè latte segment" is used to describe elitist voters. ^ "Latte – Definition of latte by Merriam-Webster". merriam-webster.com. ^ "latte – definition of latte in English from the Oxford dictionary". oxforddictionaries.com. ^ "Latte". Oxford English Dictionary (new online ed.). Oxford University Press. Retrieved 2011-11-22. ^ Davids, Kenneth (2001-05-04). Coffee: A Guide to Buying, Brewing, and Enjoying, Fifth Edition. St. Martin's Press. pp. 153–. ISBN 978-0-312-24665-5. Retrieved 18 January 2014. ^ "Coffee traditions in Italy". Ms adventures in Italy. 2007-07-11. Retrieved 2011-11-22. ^ "Steamed milk nothing new for coffee drinkers". Ocala Star-Banner. Jan 4, 1995. .
^ "Americans wake up and smell the coffee". New York Times. 1992-09-02. ... espresso-based drinks with names like caffe latte ... .
^ Brown, Nick (2016-12-12). "Remembering Latte Birthplace and Quintessential Counterculture Destination Caffe Med". Daily Coffee News. Retrieved 2018-09-12. ^ "Iced Caffè Latte". Starbucks.com. Retrieved 19 May 2014. ^ Johns, Sherri (2005). Coffee Cafe. New Holland Publishers. ISBN 978-1-84537-037-4. ^ Laskin, Avner (2009). Coffee: More Than 65 Delicious & Healthy Recipes. Sterling Publishing Company, Inc. p. 46. ISBN 978-1-4027-4937-7. ^ Santos, Roseane M.; Lima, Darcy R. (2009). An Unashamed Defense of Coffee. Xlibris Corporation. p. 187. ISBN 978-1-4535-3424-3. ^ Moore, Victoria (Apr 22, 2010). How to Drink. Andrews McMeel Publishing. pp. 144–145. ISBN 978-0-7407-9845-0. ^ Charles Leroux. 2006. The bootleg latte: Would you make one? October 5. Chicago Tribune. ^ Ohrt, Andreas (22 November 2006). "SEND THE SAVINGS TO THE POOR DEHYDRATED CHILDREN OF THE WORLD WHO DON'T LIVE WITHIN A HALF A BLOCK OF A COFFEE SHOP". Boise Weekly. Retrieved 26 January 2010. ^ Allison, Melissa (12 September 2006). "Baristas Having a Cow Over Dairy 'Thefts'". The Seattle Times. Retrieved 16 June 2010. ^ Glaister, Dan (18 September 2006). "Ghetto-lattes have baristas in a froth". The Guardian. Retrieved 2009-06-29. ^ Leroux, Charles (5 October 2006). "The bootleg latte: Would you make one?". Chicago Tribune. Retrieved 2008-07-18. ^ Nunberg, Geoffrey (2007). Talking Right: How Conservatives Turned Liberalism Into a Tax-raising, Latte-drinking, Sushi-eating, Volvo-driving, New York Times-reading, Body-piercing, Hollywood-loving, Left-wing Freak Show. PublicAffairs. ISBN 1-58648-531-8. Retrieved 2013-05-28. ^ "The politics of me". New York Times. August 18, 1996. ... self-indulgent, self-centered, latte-drinking, DKNY-wearing, BMW-driving, inner-child-searching softies. .
^ "The anti-mall". New York Times. October 9, 1994. ... hip-hopping community of MTV-watching, planet-saving, latte-sipping individualists ... .
^ de la Court, Susan (Apr 6, 2012). "On Twitter, or in Tim Hortons, politicians need to listen". Toronto Star. .
^ "Is the U.S. Tea Party movement seeping into Tim Horton's territory, Canada?". Toronto Star. Sep 10, 2010. .